Too often we make resolutions to change something about ourselves, and never do them. However – life has a way of pushing you over that cliff that you’ve been edging. This year (actually it began in November) I resolved to accomplish many things – namely rebuilding me. Yes, we all hear about mid-life crisis but what happens when you are in mid-life demolition/restructuring? There comes a time in your life where you look at everything …and I mean EVERYTHING with a finer toothed comb. Not innane things like what car you drive or even what job title you have – but more important things like, are you happy with your job? Does your work satisfy you at the end of the day? Is this what your plan looked like 5 years ago? How about more philanthropic questions like: Are you doing enough for your community? Do you know who your neighbors are? What about the education level of your town? How many homeless do you have living there? etc. And for me the deepest challenges – my faith: Am I practicing my faith daily? Do I seek activities that will expand my soul and do the work needed for the Greater Work? How am I being useful? For me – life has had its moments of challenge and pauses. Deaths, marriages, relocation, unemployment, familial issues, etc. And I have been the good daughter, mother, wife, employee (sorta on that last one)…all of which have aided me in becoming the woman I am today. But now – my mother has passed on, my father is able bodied and living with siblings, my sons have moved out and are standing firmer on their two feet and my wife and I (now married as of May, 2013) are looking to enrich our lives. …and I am looking to enrich my own. So in November I applied and was accepted into an Esoteric School to re-explore my faith and see it from a new perspective. I’m taking on challenges to grow daily and …to avoid my own lethargy. I’m sorting out the parts of myself that were and should be but are not any longer and the parts the are and should be severed forever. This is a pretty big project. Its easy to see what you let go of while being a responsible adult. Its hard to see what you need to let go of that is holding you back. At the Winter Solstice – I was delighted to attend the annual Yule Ritual with the Assembly of the Sacred Wheel (my old tradition). The feelings experienced were not ones of pain or sorrow, as had been my past – rather – it was one of shedding and opening new spaces for light and growth and hope! Hope. After that ritual, I’ve found a new vocabulary and blessedly, a new patience that I had been lacking. It has been immensely helpful. And lastly – I’m writing my Bucket List. The official one (not one of those meme kinds). They even have a website for this sort of thing! http://www.bucketlist.net/ It’s kinda cool to think that others are attempting similar things in life. I’ve even set up a “tribe” to learn 2 languages! 2014 and new resolutions may be passé, but for me – its a chance to really try and make good on a few key promises my child self made to me long ago. 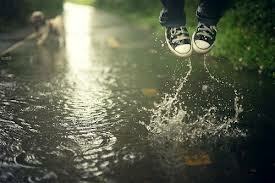 Let the jumping in the puddles begin!